For about three years now, I’ve been teaching myself guitar electronics (which I’ve written about before), and stompbox effects in particular. As a software and data kind of guy, it’s a nice to have a hobby that’s physical — but still technical — and also useful to my band as we explore new soundscapes. After building a few DIY all-in-one kits, I graduated to sourcing my own parts, and more recently to designing my own circuits! The JANUS is based on three classic distortions that evolved over the 1970s. The first was the Blue Clipper (1972? ), supposedly one of the first op-amp-based overdrives, created by a boutique guitar/effects maker named Dan Armstrong who left amplifier company Ampeg to strike out on his own. According to legend, someone from MXR picked up one of Dan’s units at a convention and their engineers modified it to make the MXR Distortion+ (1973). This was further adapted for the DOD Overdrive 250 (1976), and cloned by numerous other manufacturers over the years at well. It has been well-known for a long time that the MXR Distortion+ and DOD 250 are the same circuit with slightly different components. In fact, most of the DIY projects you can download or buy online to clone these pedals use the exact same circuit board for both! After researching the schematics online, I identified the ways in which the Blue Clipper was a “special case” of the MXR/DOD circuit, with a few components tweaked or removed, and was able to compile a “diff” of the three units to explore further. After settling on this classic-but-simple circuit as a starting point, I implemented the general schematic on a breadboard. From there I added, swapped, and removed bits from the three effects to prototype different combinations. Using my “Proto Box” (inspired by the now-defunct Beavis Board), I was able to use the breadboard like a functioning stompbox, and could audition different variations of the circuit using my guitar and amp emulator in real-time. In the photo below, you can see a few resistors and capacitors strewn about, and a lineup of several diode pairs (including LEDs!) on the top-left of the board; these were to compare different clipping distortion tones. Add a”clip” switch that allows you to toggle between different choices of clipping diodes (the blue section). A few points of interest. First, the Blue Clipper differed from the MXR and DOD in that it used mismatched resistors for R2 and R3, which “mis-bias” the op-amp and make a pretty wonky distortion sound in its own right. Turns out I didn’t like it, so I balanced them at 22kΩ. Second, the Blue Clipper and DOD 250 both used silicon diodes to create part of the distortion effect, but I also liked the smoother (but quieter) sound of germanium diodes, used in the MXR Distortion+. This is inspired me to add a “clip” switch! 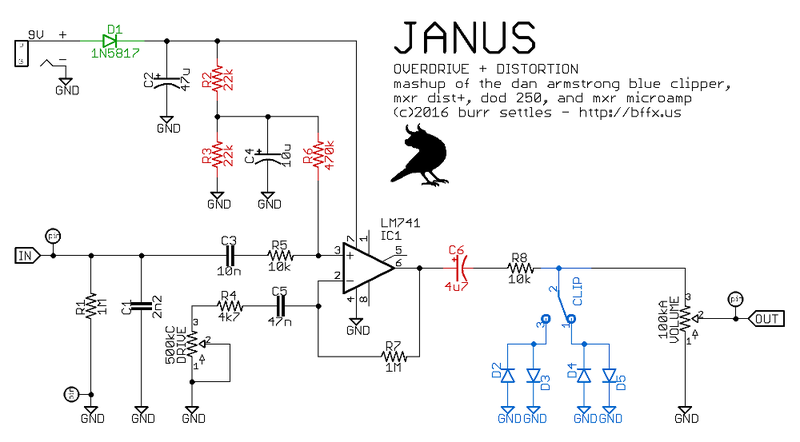 I named the effect JANUS after the Roman god, since the “clip” switch gives this classic circuit “two-faced” upgrade. My original thought was to toggle between silicon or germanium clipping diodes, but later I settled on symmetrical or asymmetrical clipping instead (more below). I also realized I could use an “on-off-on” toggle switch, which allows for three distinct tones (bypassing the diodes completely in the middle position, although this also sorta bypasses the logic of the mythological name). It turns out this is a pretty common DIY mod for distortion effects, but I thought I was being clever at the time! The clipping diodes distort the audio waveform, by cutting off the voltage in one or both directions of the sound wave’s cycle. One way to do this is with a cyclical diode network that connects the audio signal to ground. For example, the diode pairs D2-D3 and D4-D5 in the JANUS form two cyclical clipping networks, and the “clip” switch toggles between them (see the blue section in the schematic above). If you bypass the networks, there will be no clipping and the signal goes through undistorted. If the diodes are a matched set, you get symmetrical clipping and the sound starts to resemble a square wave. If the diodes are mismatched, you get asymmetrical clipping, where the two directions of the sound wave get cut off in different places. This leads to a more pleasing, “organic” sounding distortion (in my opinion). I chose a matched set of silicon diodes (1N914, .7v cutoff) for the symmetrical setting, and a germanium diode (1N270, .3v cutoff) with a red LED (1.2v cutoff) for the asymmetrical setting. Notice that the sums of the cutoffs are similar for both clip settings (1.4v and 1.5v), so they feel like they have the same volume even if they output different waveforms. The bypass setting, however, is a lot louder because nothing is clipped. At lower levels on the “drive” control, all three sound relatively similar since there isn’t enough amplitude yet for the diodes to clip very much. At higher drive levels, the symmetrical diodes start to take on a harsh distortion effect, the asymmetrical diodes feel like a warmer overdrive, and the bypass can be used like a “dirty boost” (as opposed to a “clean boost,” since the op-amp does add a bit of distortion by itself). Two more design goals were to (1) build this into a 1590A “mini pedal” enclosure, and (2) learn how to design professional printed circuit boards (PCBs). The status quo for the latter seemed to be the EAGLE CAD software… which is not at all intuitive and has a very steep learning curve. Thank goodness I found a tutorial series aimed at DIY stompboxers that really helped. This process has been very rewarding, and I’ve already had a friend comission me to build him a custom JANUS from one of the other two PCBs in my fabrication order. I’ve also begun working on other effects designs: fuzz, booster, tremolo, chorus, envelope filter, phaser, etc. (all named after mythological characters). For the most part, I expect these projects to be based on classic effects with various hacks and mods that I discover, at least until I get a better grasp on all the fundamentals and can start from scratch.